Related titles may be found by using the library's Catalog (Catalyst). To see freely-available examples of conference posters, visit F1000Research or figshare. The Johns Hopkins Medicine Branding & Use of Name Toolkit has a research poster template. 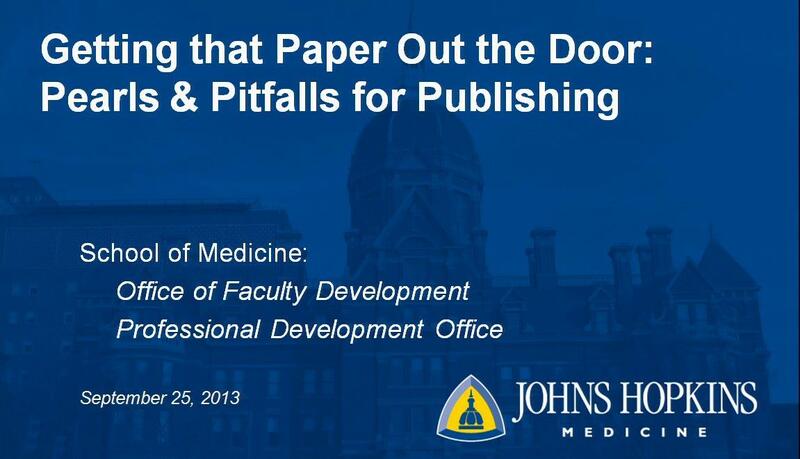 The video recording of this interactive symposium covers key topics in the writing and publishing process, including focusing on your message, time management, dealing with perfectionism, authorship questions, and journal selection. Additional resources are available from the Office of Faculty Development and the JHM Professional Development and Career Office. This course, offered through JHU myLearning, will help you learn the basics of avoiding plagiarism during your academic career and beyond. The following are research reporting guidelines for major study types. Additional guidelines are available from the EQUATOR Network, FAIRsharing, and the National Library of Medicine. Offers a checklist of 23 items to guide the reporting of practice guidelines.